Index sheet to the wartime topographic map series. Source: WIG map archive. 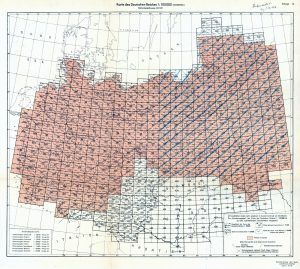 There are many known examples of the German military re-purposing Polish maps for their interests before and during World War II, whether large-scope regional, cadastral, or city street maps. Topographic information had been available on maps in Poland for some time before WWII, as a result of administrative and defense surveys; see for example the 1926 regional map on this site. The map on this page from the online collection of the WIG Map Archive shows the German military exploitation of refined Polish data on land forms, waterways, roadways, and other communication paths of the occupied Generalgouvernement, in and nearby to Rohatyn. Contour lines depicting the terrain east of Rohatyn, rising to the peak of Devil Mountain. The map is labeled Brzezany and details not only the regional center of Brzeżany, plus Rohatyn, but also other major towns including Bukaczowce, Bursztyn, Kozowa, Podkamien, Przemyślany, and Zborów. Scaled at 1:100,000, the map includes an extensive legend of symbols in Polish language, translated to German. A redline grid overlays the geographic information, aligning the map with the German reference network. Topographic contour lines are drawn at major increments of 20m, with some minor increments of 10m where the slope is relatively flat. East of the town center, the 350m peak of Czortówa Góra (today Чортова Гора, “Devil Mountain”) is marked; the ancient sacred mound is today a nature reserve for unique flora, and is a centuries-old source of many local legends. The warning on the map. 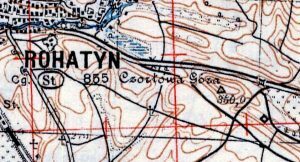 Although numbered Grossblatt 416, the map notes the Polish survey maps it references, including the section P51.S39 which covers Rohatyn. A label at the top right of the border makes its purpose clear: German Army Map: Not intended for the public! Troop edition Nr.1 v. II 44. The map is an artifact of both the Polish survey sciences and the German wartime occupation. 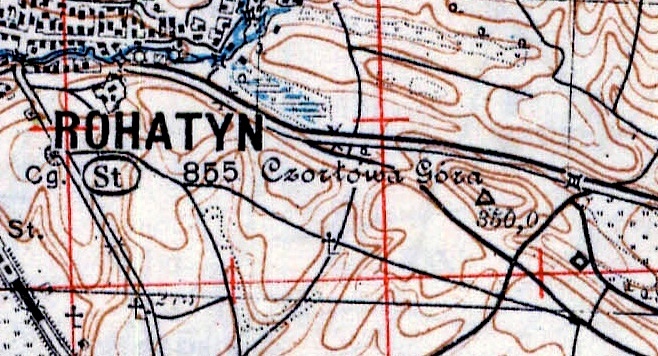 This 1944 map is the image presented in an overlay on Bing Maps satellite data from the contemporary town. The image is interactive: pan and zoom are available with ordinary mouse controls or gestures, depending on the device, and zoom is also available by the +/- buttons in the upper left of the display. The map can be made transparent in 10 steps by sliding the control in the upper right of the image. This 1944 topographic map is one of a series of historical map overlays included in the project Mapping Rohatyn: Geography as an Education Resource.